​ Please make a note that it's for the NC LoveFest Ascension Gathering. 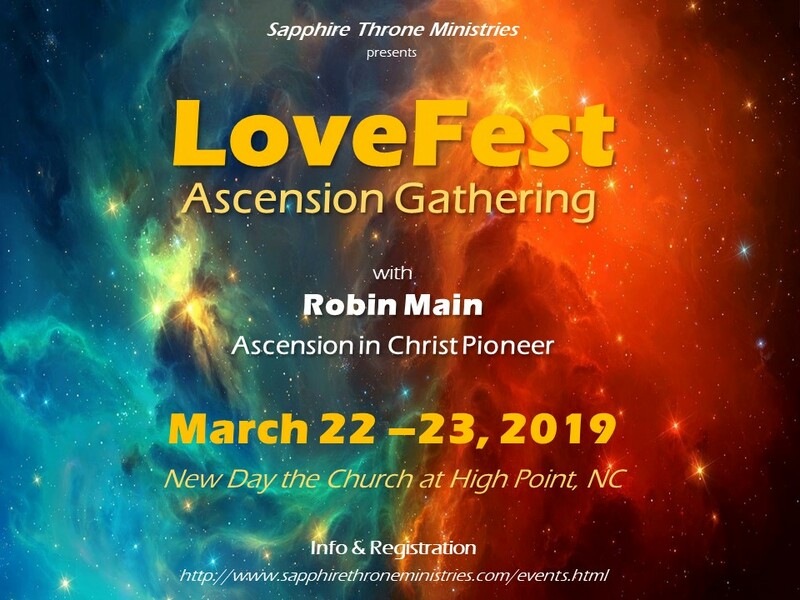 EVENT: Beginners and seasoned flyers are welcome to our first-ever authentically Christ-centered, joy-infused LoveFest: Ascension Gathering!!! ​Receive a practical Biblical foundation and spiritual infusion for Ascension in Christ. KEYNOTE SPEAKER: For many years, Robin Main has practiced the pathways to Heaven and entered into the Kingdom of God within (Luke 17:21), having “supernatural encounters of the divine kind.” Beginning in 1999, under the mentorship of Nancy Coen, Robin began practicing Ascension in Christ where she has experienced the Heavenly realms - the life that is hidden with Christ in God (Col. 3:3). She hid these experiences in her own heart until the Lord’s timing. Now, Robin has put her energies toward training others in Ascension, so we can partake of our royal invitation in Christ – that is, to “come up here” (Rev. 4:1). She has pioneered group ascension in various venues, such as children and artists, as well as training leaders to facilitate group ascensions. Robin also wrote the Ascension Manual in 2016, the first Christian publication of its kind. Her creativity, integrity and love for Jesus and people has caused many to be transformed through connecting to the perfect heart of our Heavenly Father to mature into the Mind of Christ. ​HOTEL: Limited number of rooms at special rates at the Hampton Inn, 7803 National Service Rd, Greensboro, NC 27409 USA. NOTE: All hotels are approximately 3 miles from New Day the Church at High Point; therefore, please plan to provide your own transportation. ​TO REGISTER: For details, refer to the COST information above.